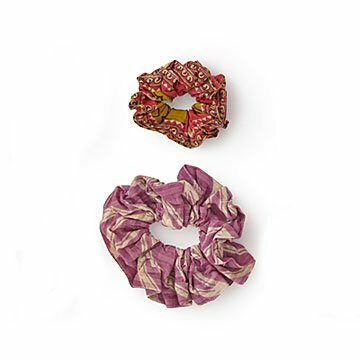 A throwback to classic '90s style, this scrunchie duo updates the look with colorful repurposed sari fabric. Everybody loves a good comeback story, especially served with a sprinkle of nostalgia: scrunchies, the classic '80s-'90s hair accessories, are cool again. These two—one medium, one large—finish your look with bright pops of color and pattern, because the fabric covering the elastic hair ties is repurposed sari textiles. They'll stylishly secure messy ponytails and buns, just like their ancestors did back in the day. Set of 2. Handmade by women artisans in India. Note: Because the sari fabric is chosen randomly, choice of color is not possible. Each scrunchie is different.